The Paris Opera (French: Opéra de Paris, or simply the Opéra) is the primary opera company of Paris. It was founded in 1669 by Louis XIV as the Académie d'Opéra and shortly thereafter was placed under the leadership of Jean-Baptiste Lully and renamed the Académie Royale de Musique. Classical ballet as we know it today arose within the Paris Opera as the Paris Opera Ballet and has remained an integral and important part of the company. 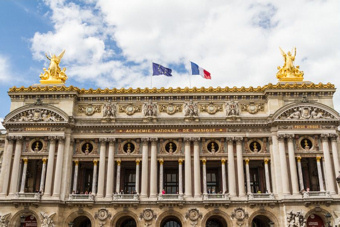 Currently called the Opéra national de Paris, it primarily produces operas at its modern 2700-seat theatre Opéra Bastille which opened in 1989, and ballets and some classical operas at the older 1970-seat Palais Garnier which opened in 1875. 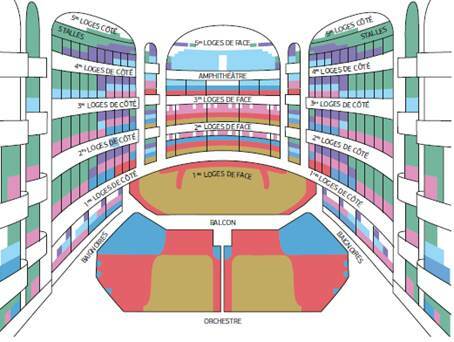 Small scale and contemporary works are also staged in the 500-seat Amphitheatre under the Opéra Bastille. Each year, the Opéra presents about 380 performances of opera, ballet and other concerts, to a total audience of about 800,000 people (of which 17% come from abroad), which is a very good average seat occupancy rate of 94%In the 2012/13 season, the Opéra presents 18 opera titles (two in a double bill), 13 ballets, 5 symphonic concerts and two vocal recitals, plus 15 other programmes. The company's training bodies are also active, with 7 concerts from the Atelier Lyrique and 4 programmes from the École de Danse. The Palais Garnier is "probably the most famous opera house in the world, a symbol of Paris like Notre Dame Cathedral, the Louvre, or the Sacré Coeur Basilica." This is at least partly due to its use as the setting for Gaston Leroux's 1910 novel The Phantom of the Opera and, especially, the novel's subsequent adaptations in films and Andrew Lloyd Webber's popular 1986 musical. Another contributing factor is that among the buildings constructed in Paris during the Second Empire, besides being the most expensive, it has been described as the only one that is "unquestionably a masterpiece of the first rank." This opinion is far from unanimous however: the 20th-century French architect Le Corbusier once described it as "a lying art" and contended that the "Garnier movement is a décor of the grave".